Got Him on Milk and Alcohol? This little guy was found abandoned in a bag. Luckily he was discovered and is being nursed back to health by his new mom. We caught up with him at our favourite local distillary, Hangar One. Hangar One is a great place to spend the afternoon tasting eleven of their distinctive vodkas and spirits. 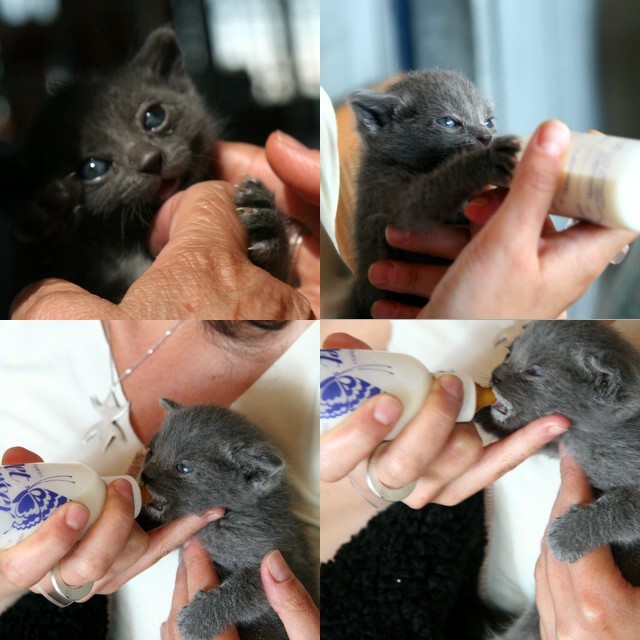 But remember, if you are a kitten, or under 21, milk is a much better bet! Don't drink and drive - if you live in San Francisco you can take the ferry from the Ferry Building to Alameda. It's about half a mile walk to the Hangar. PS. World Cup 2006: Bonne chance a France aujourd hui! OK, those photos are KILLING me! and hangar one makes a wasabi vodka that's amazing in bloody maries! Hiya Sam, I'm the Hangar One kitty mom (thought you looked familiar when you were in last week). Your photos are lovely! Despite that she remains nameless due to chronic indecision, Kitty's growing fat & happy; she's getting a tongue bath from my dog as I type. To locals hopelessly smitten with Hangar One and Kitty: she'll be working the tasting room with me the next few Sundays, so stop on by, sample our wares, and give a baby cat some love. She may even have a name by then (I'm avoiding "Chairman Meow" until full-on desperation hits). Ohh, this kitten is sooo sweet!!! How can you abandon such a sweet baby? And it's the sweetest kitten in the whole world!! I think that lucky kitty's name is Spirit. Currently hand rearing kittens myself and I have the say the vodka for the grown ups is a must! That is one gorgeous little kitty. I can't decide which one is luckier, kitty or her new mom. I'm usually not a fan of animal pics, but you really took some beauties here, Sam! Well, if you found him the 23rd, you can call him Zidane, it was his birthday. And Because we won !!!! The cat is a lucky guy,he found a caring family as yours! Also, we are lucky you found him and posted those adorable pictures. I hope to see more next week. Thank you for saving the tiny little fellow. OMG, s/he is so cute! We've got a tumble (my collective noun for multiple kittens) of kittens at our place and they are such a blast. Now I have another reason to try to get over to Hangar One. I did sample enough of their products while out this weekend though. What a cute little kitten! Hangar One sounds like a great way to spend an afternoon. Getting there via the ferry must be so nice. Just another thing to but on my list for my next SF trip. He looks exactly the same as my cat when we got him - glad he's found a good home. Thanks for all the kitty comments - I couldn't fail to get a lot of good comments with such a cute picture, could I? Special thanks to Laurie, the kitten's mum, for stopping by, I hope to find out what the name will be some time in the future and report back here. It always makes me a bit angry when I hear how people mistreat animals... maybe their karma will be to find themselves lost at sea and never to be found again!! Glad the little one found a good home! Me, I prefer vodka over milk. Stopped drinking milk a long time ago... must mean I'm grown up, though my friends don't think so sometimes!! We're going to Hangar One soon, to sample & relax. I hope the kitten is still there in a few weeks! Main attraction dead on his feet Black man rhythm with a white boy beat They got him on milk and alcohol They got him on milk and alcohol.